You will no doubt know the story of Aladdin already. You probably saw the Disney film in fact! 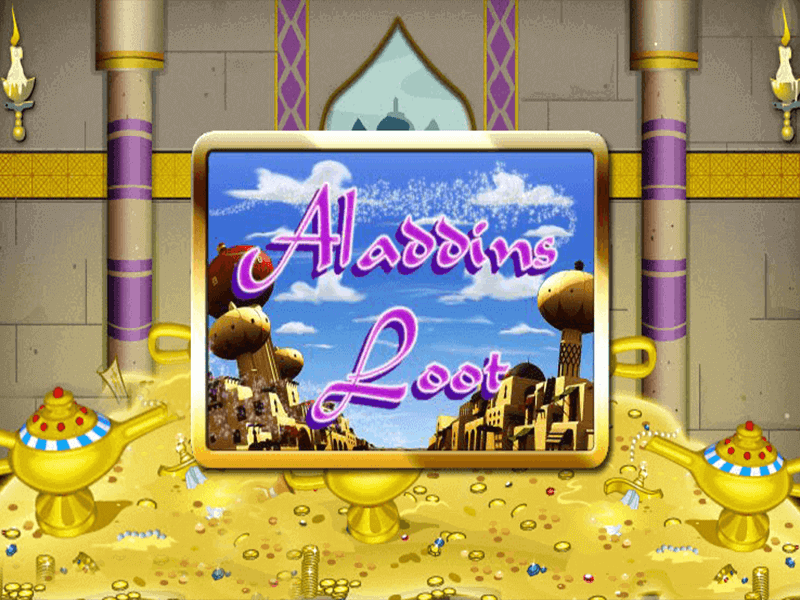 Well, the Aladdin’s Loot new online slots game takes inspiration from that tale and sends us back to meet up with the gang again. You’ll be playing with a few familiar faces, like Jasmine, the flying carpet and, of course, Aladdin himself. So, it’s time to give the lamp a little rub again and hope that a genie bearing gifts appears from it! Have a look at other top-rated slots on SlotsBaby! 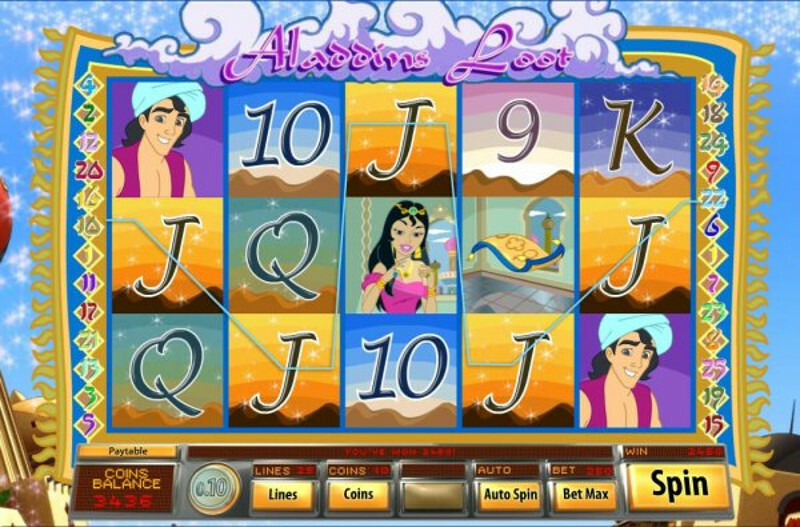 Aladdin’s Loot has been created by the developers at Saucify, an international gaming company. Admittedly, this particular offering isn’t as good as the usual Saucify game and appears a bit simplistic compared to their other premium casino games. Though its adorable theme does give it bags of charm which helps to keep the developers’ reputation as solid as it ever was. If you love promos, check out Slotsbaby today! 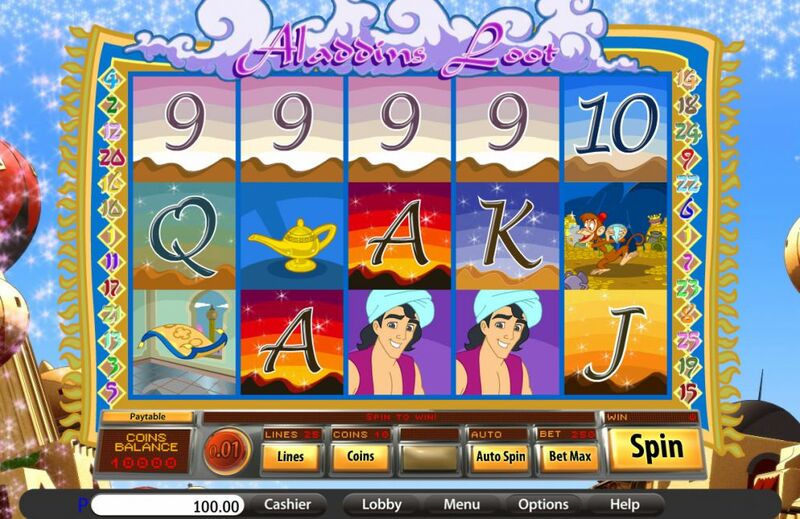 You might think that Aladdin is taunting you as you will be playing in his treasure chamber, surrounded by piles of gold coins and shining jewels. But if you play your cards right, he might let you walk away with your own stash of cash. This is a standard five-reel slot game and comes complete with twenty-five pay lines. When it comes to spinning, numbers and letters are the lowest-value symbols. The ones you want to watch out for are the picture symbols. You’ll notice that most of these are the characters from the Disney story – Aladdin, Jasmine, the monkey, and even the genie! These are the ones that can help you increase all of your winnings. WILD SYMBOL – You will already know what Aladdin looks like. He’s this game’s Wild symbol and can help your pot of winnings grow. He can jump on top of any of the other symbols, apart from the Scatter. SCATTER SYMBOL – In order to rack up the free spins, you need to land the Scatter symbol. In this game, it’s the genie’s lamp. Spinning three, four or five of them will get you some freebies. Obviously, the more you land, the more free spins you will get. The most you can win is a grand total of forty. There’s another Scatter too that I should mention – the genie himself. Five genies on the board will pay out a massive 2,500 game coins. You’ll still win some coins for four and three genies, just not as many.